“It still has sunk in that I’m going to the Olympics,” said Langlois. Miah was a standout athlete leading her Catholic Central Comets to their 1st ever Senior Girls Basketball Championship. 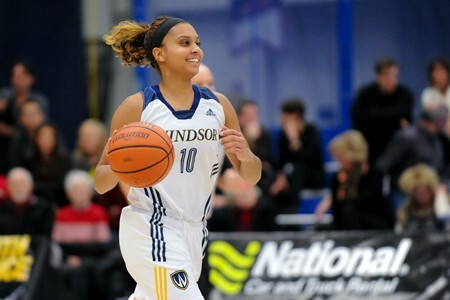 She continued her post-secondary basketball career at the University of Windsor, studying Business-Economics. She led the Lancers to 4 consecutive CIS National Championships (now called USPORTS). She was selected 3 times as CIS Final 8 Tournament MVP, along with being selected to the CIS All-Canadian Defensive Player of the Year. She was also named to 2nd Team All-Canadian 2X. Miah was part of the 2015 Canadian Women's Basketball team that participated in the 2015 Pan Am Games, held in Toronto. She aided her team in bringing home their first ever Pan Am Gold Medal in Women's Basketball. She averaged 26 MPG and 6.2 APG. Miah was also a member of the Rio 2016 Olympic team who placed 7th. She averaged 25.1 MPG and 7.3 PPG. Her professional started in Sweden, with Northland Lulea. She spent a year playing the Northland and is now playing in Russia for Dynamo-GUVD. In the 2015-16 season, she averaged 16.2 PPG, 4.6 APG, 5.2 RPG and shot 33% from 3PT.